Every meal has a story, at least one. This one has several–backstory, present tense, the story to come. And I’m going to start the meal by saying the ridiculous: a week and a half ago I had the best meal of my life. Yes. The best meal of my life. Thus far. And I’ve still got some time left, so this might be replaced next week, next year, fifteen years from now…but isn’t that the point of food? This meal, this best meal, occurred at Lexington’s The Red Hen–a tiny red barn-like restaurant that seats only 35 people or so. It also occurred during the last week of chef Tucker Yoder’s last week as executive chef at The Red Hen. It was also heightened by the fact that I skipped out on a poetry reading I was supposed to be at (part of my “job” as a stipend recipient in my program). It was also a meal I’d been waiting almost a year-and-a-half for, given that since before I moved here to Roanoke I knew I wanted to check out the restaurant and I begged nearly everyone I knew to go with me to no avail. Some even promised but it never panned out. So making it to the place a mere two days before it utterly changed (word is the new EC is from Blackberry Farm–ohhh, I can’t wait to taste the new chef’s food!) was incredible; incredibly lucky. 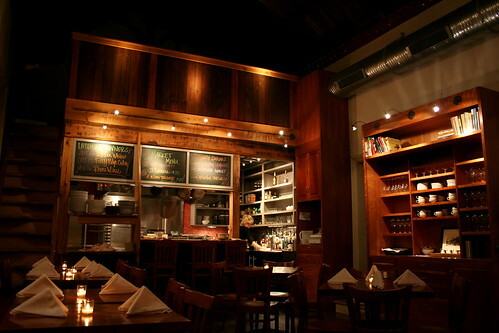 Our reservation was at 8:30, the last seating of the night, and when we were seated we noticed, ironically, that a crew from Local Roots and Border Springs Farm was seated a few tables down from us. Roanoke represent, eh? We were a bit out of it from the drive–so dark so early these days, and Lexington is an hour or so away from Roanoke–so it took awhile to decide if we wanted cocktails (the Bitter Chef with Makers Mark, bitters, smoked sugar cube, and lemon twist was calling for me) or wine, but we decided on splitting a bottle of wine in the end (Alberti 154 Malbec 2009, Argentina). 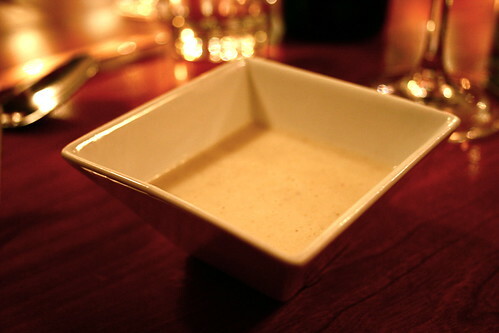 Almost immediately we were served our amuse bouche, a lovely small dish of sunchoke soup. Not the most exciting start to the meal, but definitely comforting and definitely good. I love sunchokes but hate the work (so. much. grit.) so I love it when the humble tuber is on a menu. A good start to the tasting, to say the least. 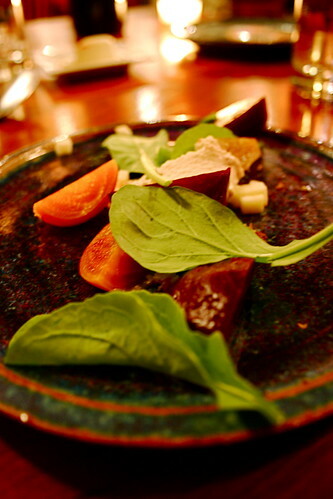 First course was an arugula, red & golden beet, in-house tofu, cracked wheat, and apple salad. Holy mother of tofu–I could eat it any day. Yes, I’m a used-to-be-vegan so naturally tofu is dear to my heart, but this tofu went beyond anything I’ve ever eaten. In fact, it was almost like cheese: soft and melty in the mouth, with a tang reminiscent of some bleu cheeses. I used to think artisan tofu was a joke–not any longer. As for the beets and arugula and apple, etc., they were delightful and well thought out, one of my favorite elements being the way the textures played off each other from the soft tofu to the crunch of the apples to the gritty cracked wheat. Not to mention the fact that Chef Yoder made me almost like beets. Almost. I’ll eat beets prepared by him any day, but maybe not the ones I attempt in my own kitchen. 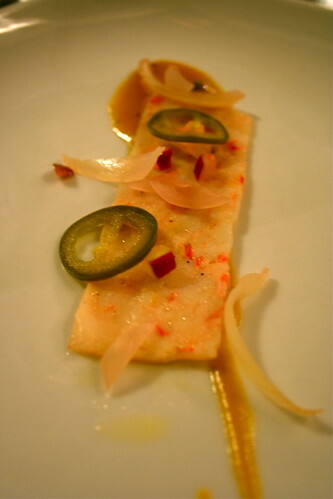 Second course was flattened shrimp (I know, not so flattering but I can’t think of the technical name–essentially a method where the shrimp are flattened, pressed into a block, and then thinly cut to make a 1/4 inch rectangle of shrimp) with apples and pickled onions & jalepenos in a yellow curry sauce. Not being a huge fan of shrimp either, I was pleasantly surprised by the dish–if not, first, the appearance (flat) and then, immediately, the flavors: salty, tangy, hot. The pickled onions & jalepenos balanced the inherent saltiness of the shrimp and the apples gave a sweet crunch to match the pickles. But then the curry sauce came into play with a nice dash of heat for the palate–something I really appreciate in this area, particularly, where chefs shy away from stronger spices and peppers. It wasn’t overly hot by any means, but warming, with a complex Asian-flair to the dish. 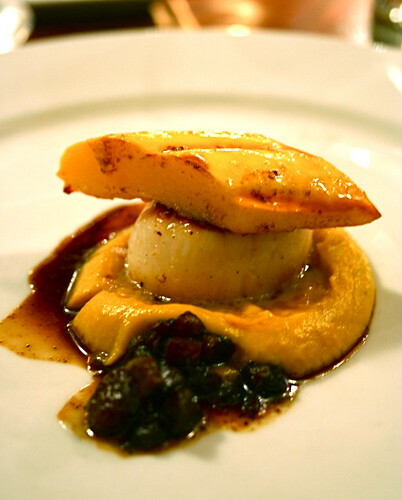 Next was another fish course: a scallop with roasted delicata squash and a delicata squash puree with bacon on the side. My first scallop post Nova-Scotian-scallop fest 2010! And it was a good scallop, to say the least. Clean, caramelized, and placed on a creamy-smooth bed of delicata squash puree with a wedge of roasted delicata on top? And with fatty cubes of bacon on the side? Could I ask for anything more comforting? I would have died to have eaten a scallop like this in Nova Scotia, land of the scallops, for this one was meaty and sweet and delicious all on its own, and even more so with the rest of the plate. And I’m sure the copious amount of butter cooked into everything didn’t hurt. Who knew a scallop could be so rich? 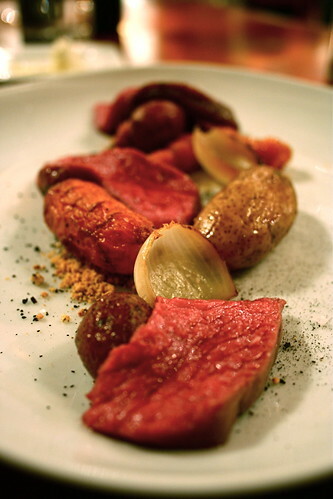 And then the meat course: locally-sourced beef, carrots, onion hash, and fingerling potatoes with a dusting of dried brown butter. Comfort food with a twist–your mother’s post roast done 1500 times better. Each bite of the perfectly medium-rare beef with a bit of carrot, onion, and potatoes melted in my mouth, spoke of grassy knolls and winter nights with cows huddled close together. I want to eat this dish on the coldest night of January. I want to eat it all winter long. My only complaint? There wasn’t enough onion hash to go around. I had to parce it out and save it for every third bite or so. But that didn’t detract from the dish, only made it possible to be better, which seems impossible. Ah, and then dessert. Blessed dessert. My training in the bakery by a pastry chef really comes through when I think about the desserts at Red Hen. 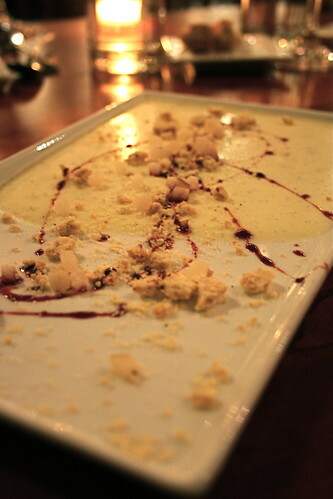 Buttermilk panna cotta with a red wine sauce, star anise, apples, and a black pepper cookie crumble. Definitely not the easiest dish to photograph, but a lovely dish to eat. Black pepper cookies–now why haven’t I thought of that? Buttermilk pana cotta? Perfectly tangy and sweet, a creamy base to emphasize the quick bite of the black pepper in the cookie crumble, the delicate eastern scent of the star anise, and the deep plush of the red wine sauce. The presentation was beautiful too, as were all the courses’. Then, at what we assumed was the end of the meal, came another dessert! Could we have been so lucky? Maybe the dish was a leftover foisted upon us at the end of the evening, maybe it was planned (although we were up to 5 courses at this point). Maybe there is a god and he/she’s in charge of presenting delicious chocolate at my feet (err…hands?). I still don’t know and I sure didn’t argue then. 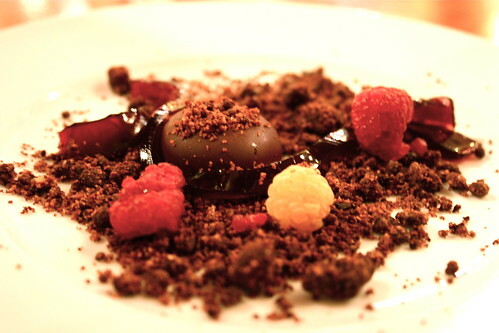 A deep-dark chocolate mousse with cocoa nibs, a red wine tuile, and red and golden raspberries. G said he could have taken or left the red wine tuile, but I think it added a little texture-depth to the dish, blending well with the crunchy cocoa nibs, the soft, delicate, rich mousse, and the bright, punchy raspberries. I didn’t want the dish to end. But I’m a lush like that. 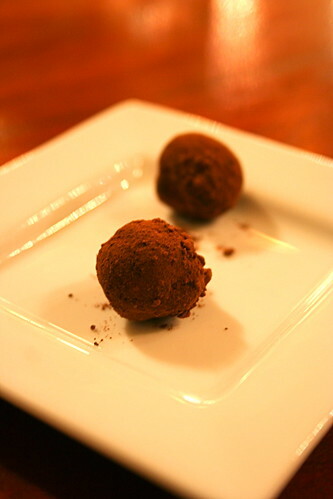 Finally, our parting gift: a cardamom chocolate chicory truffle. One bite (well, two or three if you’re thrifty like me) and the whole restaurant makes sense, Chef Yoder’s vision makes sense: the best ingredients, the most innovative techniques and flavor pairings possible for the region, and a whole lot of love. The pairing of the east with the west with Appalachia said it all: cardamom from the spice route, chocolate as understood best in Europe, and chicory, our dark coffee substitute wrassled up in the hills and valleys of our region. All blended together to make a succinct, distinct bite of goodness. The Red Hen was everything and more, to use a tired old term for such a vibrant restaurant. From the space (cozy and modern, with a very farm-like influence) to the meal (local and creative) to the people working there (I can’t speak highly enough of our server, though I don’t remember her name, for she flowed in and out perfectly, timing the courses well, and answering all my questions without missing a beat), Red Hen was amazing and I’m grateful to have experienced it, albeit so late in the game, before Chef Yoder left. And I’m deifnitely looking forward to the new vision and flavors it takes on in the coming weeks, as well as checking out Chef Yoder’s new(ish) jaunt at the The Clifton Inn in Charlottesville where he served as the executive sous chef before his tenure at The Red Hen. Thank you so much for posting about your great meal with us. I am glad we were able to serve you before my departure and I look forward to welcoming you to the Clifton soon. Oh and definitly go to Kajitsu it is out of this world and extremly affordable. Wow… That meal does look incredible! Especially that beef- it just looks so perfectly cooked. And the dessert goes with out saying. How did you like Lexington? I’ve never been to Kentucky, but I bet it full of Southern Hospitality. Trust me, the rest of Texas isn’t all like Houston…although Houston is where I fell in love with the state. It all depends where you are…downtown can be a little unpleasant haha. Sounds like you are doing great and I’m glad to see it!! Lexington, Virginia I’d love to visit Lex, KY though! Wow…so exciting to read of the best meal of your life, Jes! It really does sound special. I still remember the best meal of my life as though it was yesterday, though it was 28 years ago. By the way, reading this reminded me of a movie my husband and I saw years ago about pleasure in eating good food. It was a Japanese film called Tampopo about a widow and a truck driver looking for the perfect ramen recipe. It’s a bit quirky and even weird at times, but we still remember it all these years later. It’s also very funny…you might enjoy it if you haven’t already seen it. I loved the poetry in your description of the beef—“grassy knolls and winter nights with cows huddled close together.” Perfect! The tofu part of this meal sounds divine, Jes. Nice photos, too! Fine dinning is so much fun! I love it, just wish it was more affordable. I want to try that tofu dish! Yum! Damn. This meal looks epic! Your description of that tofu dish got my mouth watering- Sounds like a meal to remember, for sure! Now, I don’t know what else you’ve eaten in your life, but I think I might have to agree that this is the best meal of your life… so far. At least it looks like it would be in the running. All of this food looks so wonderful! I’m especially partial to delicata squash, I think it just has a leg up over other winter squash, though I can’t quite figure out what it is that makes it so great!